Vista Pacifica Convalescent is a 24-hour skilled nursing facility, specializing in Alzheimer’s care. Our 49-bed facility is a safe and secure environment with an enclosed patio, giving it a home-like setting. Vista Pacifica Convalescent provides psychiatric services to residents with secondary diagnoses of mental illness. Vista Pacifica Convalescent has on staff Clinical Psychologists, a Psychiatrist, and a Behavioral Specialist. 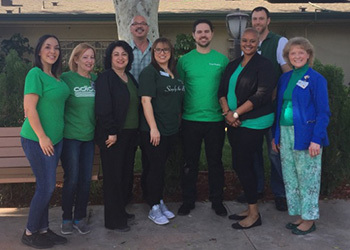 These staff in collaboration with our Interdisciplinary Team provide psychiatric services to promote the highest practical psycho-social and emotional well being of our residents. A positive and uplifting atmosphere is vital to the success of healing, recovery, and rehabilitation. Vista Pacifica Enterprises employs outgoing and friendly professional staff to create social programs and activities to fit the resident’s needs. We provide a monthly activity calendar to each resident to keep them informed of upcoming events. Friends and family are always welcome to visit and attend our special events. We have created a list of questions that we receive most often. These will help you learn more about our facility and what to expect when you arrive. Consider using our Send a Greeting feature on the website. You can choose from a variety of postcards to fill out and mail to your loved one for a small fee or you may type a message through email, send us your email greeting and we will hand deliver it to your loved one residing in our facility. Our email feature is free of charge.